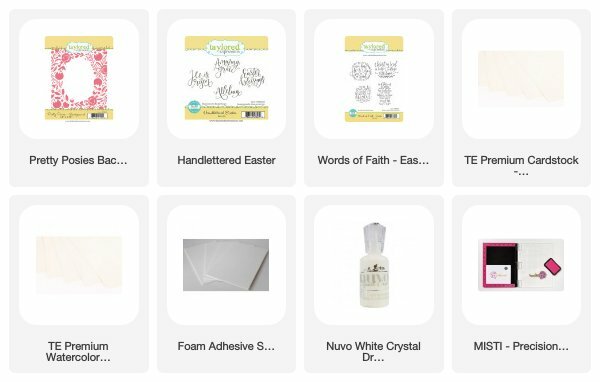 Easter Blessings! 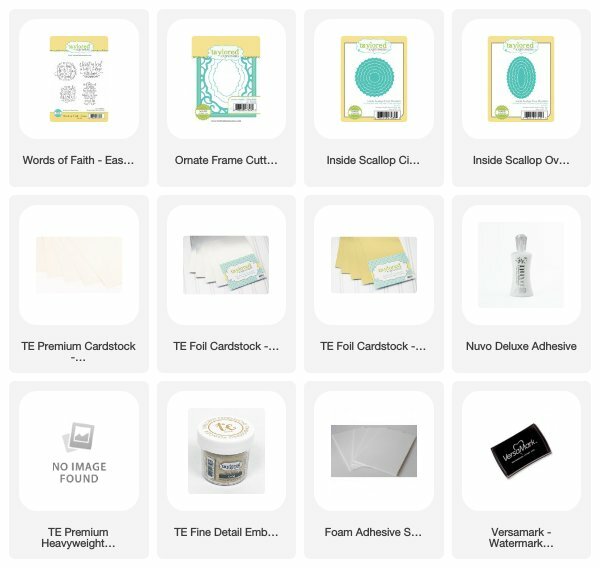 TE Feb Release Day #2 Sneak Peek! Hello Lovelies, Welcome to Taylored Expressions Day #2 sneak peek. I am so excited to share three projects today. Two using a new background stamp set called Pretty Posies background stamp. 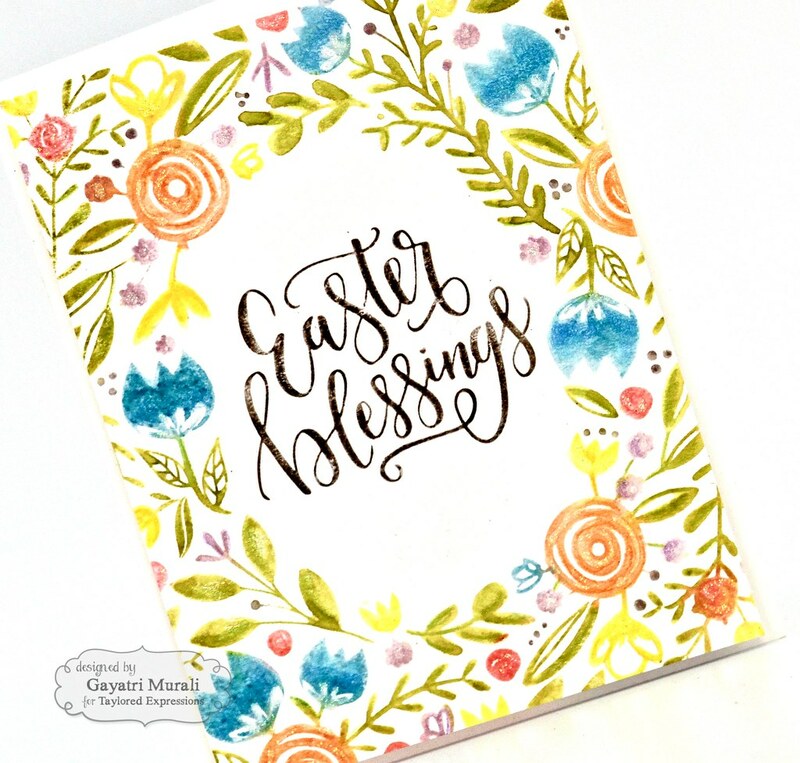 This is beautiful background stamp which I combined with two sentiment stamp sets called Words of Faith and Handlettered Easter to make a set of two cards. 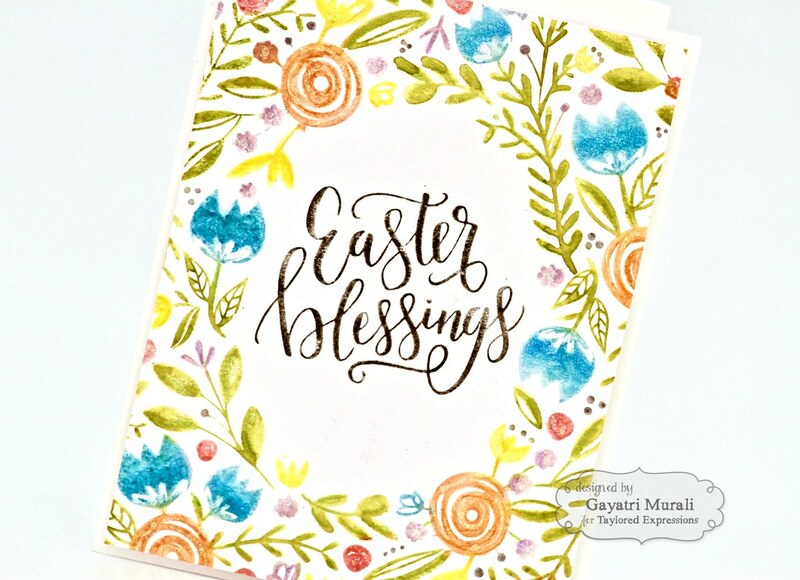 I used distress markers to colour the background stamp and stamp on watercolour paper. Using MISTI is this process becomes much easier. I coloured similar looking flowers using the Worn Liptstick distress marker, misted with mini mister and stamped on watercolour paper. Similarly the all the leaves in Mowed Lawn distress marker, then another set of similar colour flowers using Spiced Marmalade distress marker, them the smaller flowers in Broken China distress marker etc, until all the images are stamped. I love the soft watercoloured look this technique gives. You can also do the same using TE liquid watercolours. The sentiment is stamped using Black Soot distress marker and is from Words of Faith stamp set. I trimmed the panel and adhered on the card base using foam adhesive. Here are some closeups of this card. Here is the second card in the set. 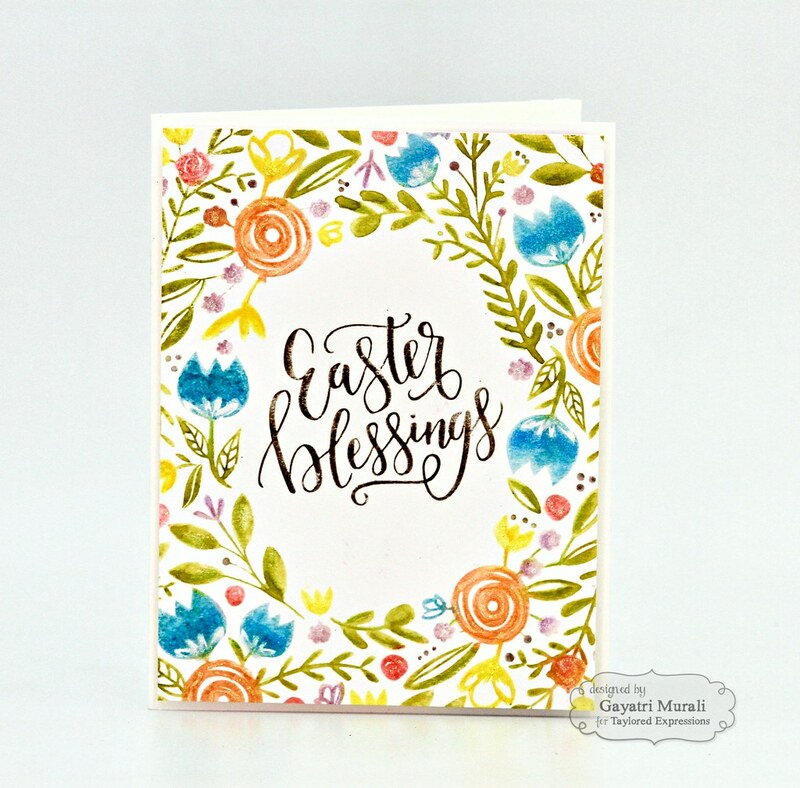 I just changed the colours of the flowers and leaves on this and the sentiment is from Handlettered Easter stamp set stamped using Black Soot distress marker. These cards have dimension because the panel is foam mounted on the card base. But you can glue the panel down to the card base and make them one layer cards. 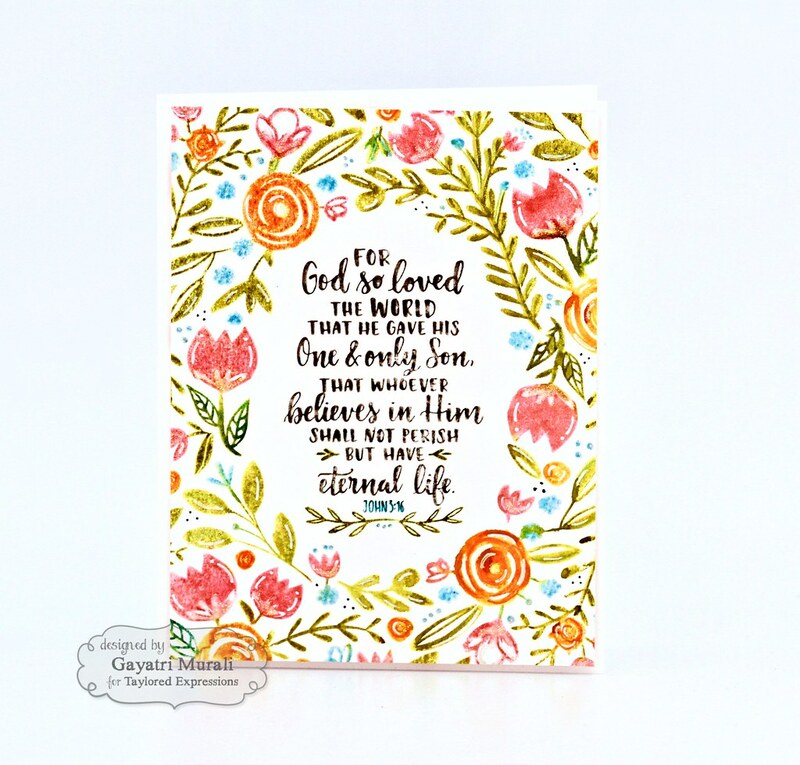 I also did not add any embellishments on these card as I wanted the watercoloured look of the Pretty Posies stamp set to be highlight of the card. All the supplies used to make these two cards are listed below. 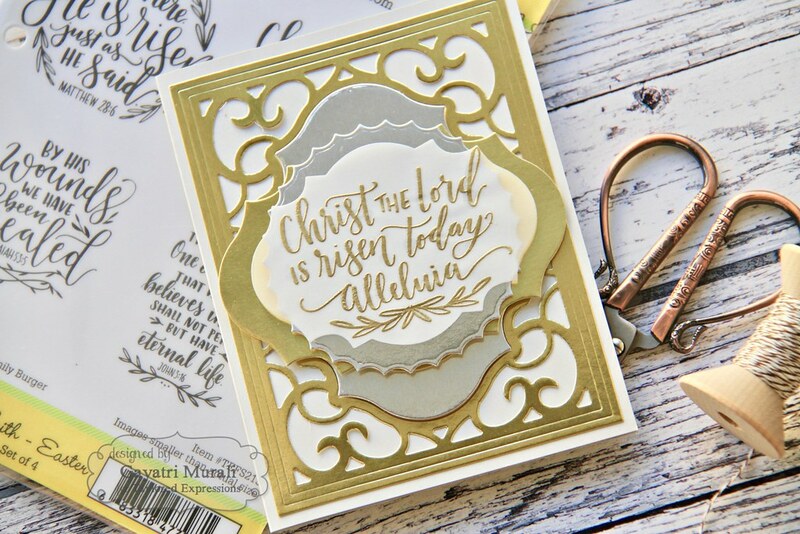 The second project I am sharing with you today used the new Words of Faith-Easter Stamp set. On one of the previous card, I used the sentiment on the bottom right side. On this card below I used the top right sentiment. I combined this sentiment with an older cutting plate called ornate Frame cutting plate to make this card. 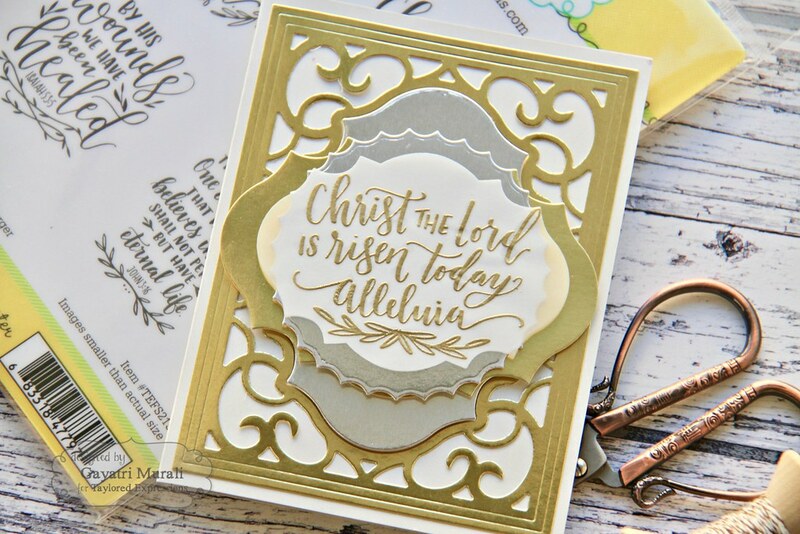 I used TE’s gold and silver foil cardstock to die cut the Ornate Frame cutting plate and layer them using foam adhesive. 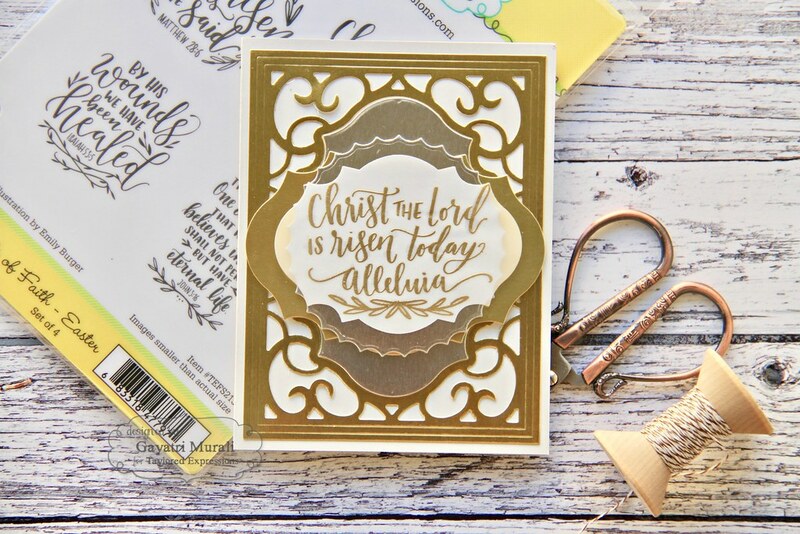 The sentiment is gold heat embossed on TE vellum paper. I also used Inside Scallop circle and oval stacklet dies to add to the layers. This card is gorgeous in real life. I just find it hard to photograph the foil cardstock so the photos do not justify the card. Here are couple of closeups where you can see the foil cardstock in its true colours. Head over to Taylored Expressions Blog to see what the question of the day is and also what the giveaway is. You can also see inspirations from Taylor and other designers of more new products. Thank you for taking the time to visit my blog today. See you tomorrow with day #3 sneak peek. 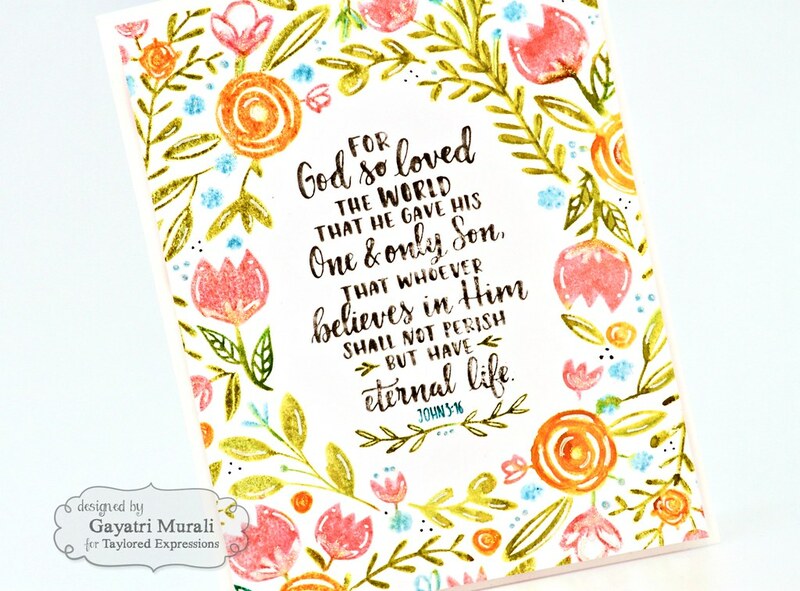 These cards are so pretty, and what a great use of distress markers! Gorgeous cards! Love the idea of using the distress markers. And I didn’t realize TE had gold and silver foil paper – so pretty!